Prepare – Find out how to register for the exam, what to bring with you on the day of the test, how the score reporting process works, and how to get ready to study. Chapters review each content area in-depth, and numerous graphic organizers provide invaluable study tools. Useful sample questions with rationales for correct and incorrect answers to each question are included at the end of each chapter to test your knowledge. Assist – Doing your best on the Praxis depends on successful study habits. The authors show you practical ways to review the material effectively and make the most of your time. Survive – Feeling overwhelmed? Learn how to get organized, develop a study schedule, take care of yourself, and manage your anxiety. Succeed – Show-up for the test prepared and confident, and walk-out knowing you did your best! 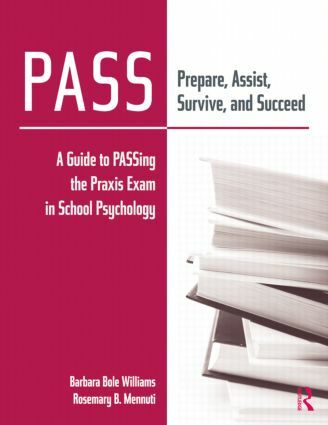 In this guide, you’ll also find reflections from students who have used the PASS model to prepare for the Praxis, along with their experiences taking the exam and some of the challenges they faced and how they overcame them. An accompanying CD contains all of the graphic organizers found in the text, six practice exams with answer keys, and other helpful materials for you to use as you prepare for the exam.